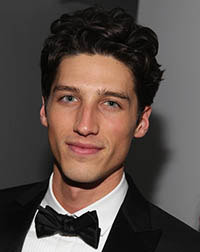 Ryan Kennedy was born in Buffalo, New York, United States, on December 6, 1982, is an American male model. Ryan began his modeling career in 2007. He made his modeling debut for the Benetton campaign. He made his catwalk debut for Calvin Klein. Ryan's hobbies are skateboarding and to play hockey. Contributing Editor, Details, Vogue Espana, GQ China, W Magazine, L'Optimum, L'Officiel Hommes China, S Moda for El Pais, V Man, Vogue Mexico Cover, Numero Homme, GQ Russia, SCMP Style, Elle Men Mexico, Vogue Russia, The Room, GQ Germany, L'Officiel Hommes Italia, GQ U.S., Robb Report, GQ France, V Man, The New York Times Online, Elle U.S..
Tod's, Clarks, Express, House of Fraser, Azzaro, Garnier, OVS Industry, Polo Ralph Lauren, Macy's, H&M, River Island, Lacoste, Sisley, Gucci, Aldo Shoes, Victorinox, 7 For All Mankind, Lord & Taylor, Louis Vuitton, London Fog. Walked runway for amfAR, J. Crew, Joseph Abboud, Ralph Lauren, Berluti, Nautica, Hugo Boss, Banana Republic, Elie Tahari, Roland Mouret, Dsquared2, Hermes, Mugler, Versace, Gucci, Dolce & Gabbana. Represented by agencies New York IMG, Paris Bananas Models, Milan I LOVE Models Management, London Select Model Management, Barcelona Sight Management Studio. I prefer to wear just jeans and a tee shirt. It's pretty boring but thats what im most comfortable in. My first big job was the Benetton campaign. Then I was booked as a Calvin Klein exclusive, so that was my first show. From there I was a Louis Vuitton exclusive in Paris, and then I booked the Louis Vuitton campaign. It was Fall/Winter 2008. My views on beauty haven't changed since I started modeling. It's the same anywhere you go.. I honestly never think about it.. There is a lot of rejection, especially in the beginning when you are first starting out. Even now there is rejection because there are so many jobs and you are only booked for certain ones. You also never know when your next job is going to be, so it can be difficult to make plans. I go to the gym a couple times a week and do light workouts. I do more cardio than lifting weights. When I was in high school, I used to play a lot of sports — I used to play hockey all the time. Now, I like to go skateboarding and to go to Central Park when the weather is nice. It's really fun to get out in the city during the day.